Google Analytics map overlay showing the countries where visitors have been located, keyed in shades of green. This is pretty similar to last year, but fills in a few more countries in South America, Asia, and Africa. This past Tuesday was my 51st birthday and 28th wedding anniversary. 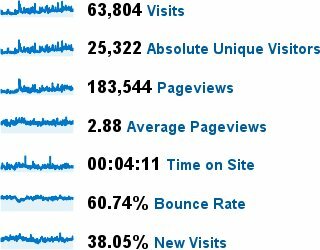 At some point on that auspicious day, the Total Pageviews counter on the right of the page crossed the 250,000 mark. A quarter-million pageviews! Thank you for that, it made a wonderful present! And purely by chance, this happens to be my 100th post. Before I break down the numbers, some cautionary notes. There were two events this year that took the blog offline. The first occurred in May. This was Google's fault, when an update to Blogger took a number of blogs offline. They had to revert to backups, and lost some posts. I was able to restore my one missing post from my browser window that was still open. Lesson learned: always backup the blog after posting to it. The Blogger software makes it easy to export a copy. When did you last backup your site? The second event occurred this past weekend. This was my fault, when I let my domain name registration (i.e. my custom website name) expire. I hadn't noticed the emails notifying me of automatic re-registration; it failed because my credit card had changed. I didn't find out until Freddy Roman sent me an email saying he got an error message when he tried to go to the site. Google Apps does have a grace period where you can renew an expired domain, but of course I didn't find out until one day after it ended. After that it falls out of their system completely and has to be handled through the domain registration provider, in this case GoDaddy.com. I called GoDaddy customer support and went through their redemption process for an $80 fee. While I was not happy about the situation, their customer support was excellent, helpful and responsive. I spoke to a human on the phone who was able to quickly connect me to another human who was able to quickly send me instructions. By the next afternoon the transaction was complete and my domain managment was fully transitioned from Google Apps to GoDaddy. Lesson learned: set multiple reminders (where I will notice them) to renew annually. When does your domain name expire? To some extent, Google has over-automated the domain registration process. They've made it so easy that you don't think about it. But if something goes wrong, it's a a mess to clean up. I'm still not 100% sure everything is all set on the Google side. Note that if the blog becomes inaccessible via the CloseGrain.com domain name, it can always be reached via the name http://closegrain.blogspot.com, since it is a Blogger site. The broader lesson here is that just as the pen is mightier than the sword, the printing press is mightier than the web server. Gutenberg triumphs again. Hard-copy publications cannot simply wink out of existence the way online publications can. There will always be a place for physical copies. Keep that in mind before you commit all the fruits of you labor to the cloud. The same old disaster recovery precautions still hold: keep multiple independent backup copies of your data. On to the numbers. Woodworking continues to span countries, languages, and cultures. The number of visits and pageviews for the year grew significantly, more than doubling last year's numbers (even considering that I didn't have statistics enabled for the first few months). Visits for the period Dec 15, 2010 to Nov 17, 2011. The Average Pageviews and Time on Site are almost identical to last year. I'm averaging over 200 visits per day, with over 500 pageviews per day. That's over 15,000 pageviews per month. Searches that hit the blog continue to be dominated by workbench topics, but bowsaws and planes are very popular, as well as all kinds of variations of the blog name, and a wide variety of specific skills. Similarly for the actual pages viewed. That tells me the blog is serving as an effective resource for people, and I've received a number of very kind emails to that effect. The number of sites linking here has grown as well. Several are foreign-language woodworking forums. I've been able to register with some of them via Google Translate; I keep the postings very simple, since Google Translate can come up with odd renderings when I translate back to English. I had visits through over 50 different Google country and translator portals. There were also a number of hits from email servers, indicating people were emailing links to their friends. A few links were due to comments I've left on other sites that people followed back to here. As before, to try to reasonably gauge which countries actually have interested readers, for countries with fewer than 10 visits and 10 pages per visit, I throw out any where the average time on site is less than 30 seconds. That still leaves 105 countries! Finally, I did manage to earn a little more Google Ad revenue, most of which went to pay the redemption fee to GoDaddy. Thanks for another great year! I always enjoy getting comments and emails (and so do other bloggers, so let them know if you like what they do; sometimes people aren't sure if anyone is listening).